"Jack Stevens was born in 1934 in a small ranching community in West Texas. Orphaned when he was about 12, he lived with his brother on the river for about 3 yrs. He then went to work on cattle ranches in West Texas and New Mexico during the rodeo off-season. Today he works on paintings, sculptures, and drawings at his home, full time, since 1970." If you are interested in any of Jack Steven's work, or would like to commission him for a special project visit his website or simply fill out our contact form and we can put you in contact with him. This is the maquette version of the life-size in WF,TX. This bronze is full of action and there is a lot to see! Notice how most of the piece is in the air, what a great sculpture! This bronze has a lot of different parts, be sure to click through and see everything! A small bronze sculpture about a boy and his dog, sharin' cookies. This bronze sculpture captures the scene of a little boy with his bow and arrow and first kill perfectly. Native American sculpted by Jack Stevens in 2000. This sculpture is full of motion and expression! 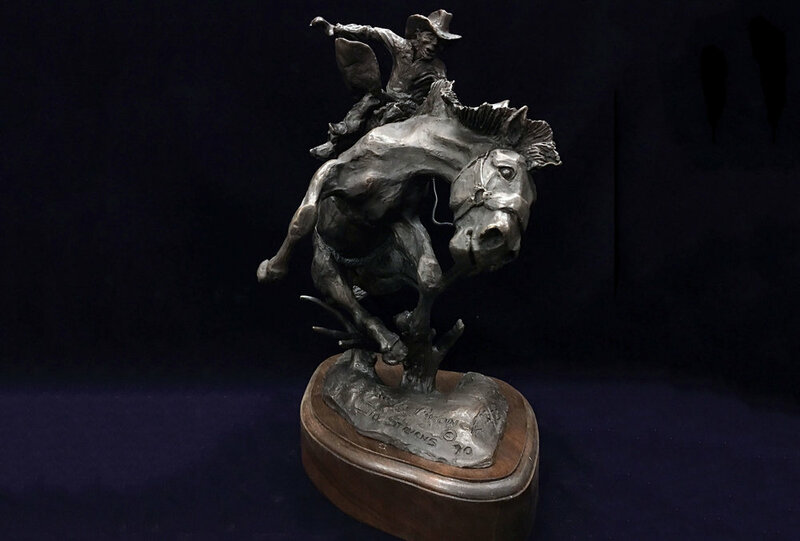 Jack does a great job capturing movement in his western sculptures! Be sure to view this entire sculpture! A small bronze sculpture of a sweet dog. A small bronze sculpture of a dog coming out of the cattails with a duck.